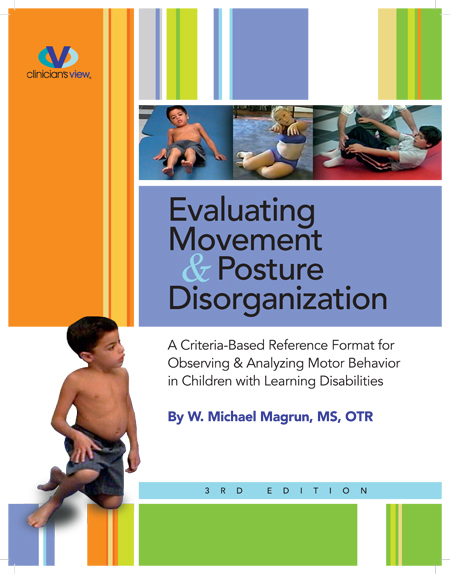 This manual provides a criteria-based observational protocol for analyzing motor organization and movement components in children with motor disorganization, through a series of movement sequences. This evaluation is appropriate for children of school age and is effective in identifying specific motor disorganization and asymmetries in body alignment and proprioceptive imbalances. Interpretation, scoring and treatment implications are provided.This 3rd edition of condenses and modifies some of the observational criteria in each subtest. The subtests are reorganized to reflect specific criteria for the movement sequences in the categories of starting position, initiation, transition, and final position. This assists the examiner in identifying more specifically the critical components that result in disorganization, such as alignment, initiation of compensatory patterns, poor grading and weight shifting during the transition of the sequence to the final posture, and asymmetries between body sides. In addition, examples of disorganized responses are presented for each subtest.